Entries tagged with “Regular Ol’ Stories”. Last week I took the radiator off my Model A Ford because the fan broke and cut a hole in the back of it. Yeah, I was pretty happy about that. I had known for a while that I needed a new ratchet nut for the crankshaft pulley on the front of the engine, so I ordered a new one a while back. I was just waiting until the next time I had the radiator off to install it. Now I had my chance. There is a special tool that you can buy to remove the ratchet nut, but I figured that I could get it without the tool once the radiator was off. It turns out that I was wrong. The ratchet nut is nestled into the concave center of the pulley, and you can’t reach it with a normal crescent wrench. Besides that, the old nut on my car is actually a different size, so the special tool wouldn’t have worked anyway. My two options as I saw them were to go out and buy an expensive tool that I would probably never use again, or go over to the garage across the street and see if one of their guys might come over and pop the nut off for me. My brother Kent got married last week in Cambria California, which is in wine country in between Los Angeles and San Francisco. I flew into San Francisco, and then caught a ride with my cousin and family down to the wedding. It ended up being a fantastic weekend all in all, but the first day of my trip alone was pretty incredible. First of all, as I was headed to the Airport I got a call from the Orbitz automated Traveler Update telling me that my flight into O’Hare was delayed due to bad weather, but when I got to the airport and checked in, I had already been re-routed through Dallas/Fort Worth. Amazing! It’s never that easy when you fly! I especially appreciated the re-routing since throughout the afternoon I kept getting calls from the Orbitz automated Traveler Update telling me how much more my original flight was now delayed. The flight was packed. They had oversold it by something crazy like 18 people. It was a small plane that had just two seats on either side of the aisle. I sat down and tried to get organized and situated quickly since I knew that the seat next to me would fill up any second. Amazingly enough, when we took off there was only one empty seat on the whole plane, and it was next to me! Time to stretch out and relax. I put the armrest up, and thoroughly enjoyed the extra room. I love hanging out with spin-top people. It’s always a ton of fun, and at MadFest this year we had a ridiculously good time. 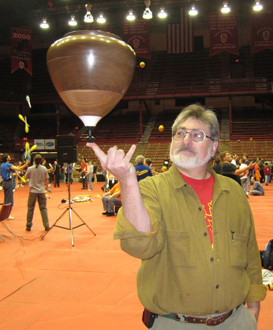 Eric Wolff with his 11″ diameter top. The largest he’s ever made… so far. For the average person, the phrase “spin-top people” is not one that is heard very often. Of all the very small social groups I belong to, the top-spinners are one of the smallest; I think only “paddleballers” are fewer in number. At the MadFest Juggling Convention this year we had a really good showing of spin-top people… and that means that there were 7 of us. Eric and Noah Wolff, Alan and Robert Gray, Chris Mulhall, Steve Brown and me. Show off new tops. This rarely takes very long since there are virtually no mass-produced tops, so it’s really a question of who had the time to make some themselves. Show off new tricks. This also rarely takes long since there are very few new tricks developed each year. Continue playing Battle Top until it degenerates into a different game that is way more fun. Mark Hayward Is My Hero is powered by	WordPress 5.1.1 and delivered to you in 0.302 seconds using 37 queries.